the jerkwerks » Apple TV, sure, why not? Apple TV, sure, why not? I have never been a big fan of watching TV. Not even as a child. Sure, I watched the occasional show, but I didn’t rearrange my life around a TV schedule. I didn’t even own a TV when I met my wife. I preferred to read books and go out to movies. Both have very flexible time tables. I was in control. Fast-forward to the Summer of 2010. Two HDTVs, each with a TiVo Series 2 (analog), 2 Comcast set-top boxes (one for the TiVo, the other for On-Demand), a DVD player, game systems, VGA and DVI cable setups for computers, and a big mess of cables. I’ve got more than enough content–too much content. Do I really need more content? I decided to downsize, plus I was forced to upgrade because Comcast was going to dump analog. Everything was replaced with a single TiVo Premier for each TV. All other devices were removed except the DVD players. And since the new TiVo’s support Netflix, Amazon On-Demand, Blockbuster On-Demand, YouTube, and Internet TV, I got rid of the computer hook ups too–didn’t need them anymore. Did I really downsize? I actually have more content options. Apple announced Apple TV again. I cannot tell you the difference between the 1st gen and 2nd gen Apple TV, but I can state that the 2nd gen failed to impress. It didn’t really give me anything that I already did not have. Apple TV had Netflix, YouTube, and access to any media available via the iTunes store. That same media is also available elsewhere. I figured for $99 US, why not? But I always seemed to find something else to spend the $99 on. My wife without any prompting got the family an LG Blu-ray player. It had a number of great features, e.g. I can access SMB servers for content. The LG’s Linux-based OS can play just about any media type, e.g. mkv, avi, mpeg, mp4, etc… (I have yet to find something it cannot play), via my WiFi or GigE network. This feature squashed any possible desire to connect a computer to the TV for content. Plus, the LG supports streaming services as well, e.g. VUDU. I now have even more content options and even less reasons for an Apple TV or even a Jailbroke Apple TV with XBMC. Fast-forward to February 15th 2011. I came home with an Apple TV. I didn’t set out to get one. I was already at the Apple store getting my old MacBook Pro repaired so that I could sell it, and then, I remembered my wife asking me if I could connect her computer up to a TV so she could watch her iTunes purchases. I knew Apple TV could play content from one’s own personal iTunes library as well as support AirPlay from iOS devices, but I never had that need, until now. My wife purchases a lot of media from iTunes primarily to watch on her computer, iPod Touch, and soon iPad, as do many others. So again, I figured for $99 US, why not? There are gobs of reviews, photos, hacks, etc… for the Apple TV that you can find, so I’ll spare you that. Instead, I’ll just post what I find most useful about the Apple TV. Apple TV can play rented and purchased media from your iTunes library. This was the principle reason I got one. You will have to setup Home Sharing. This is something that I do not like. All computers, iOS devices used for Remote (more on this later), and Apple TVs will need to use the same iTunes account. All three of the iTunes users in my home have their own accounts. My wife will be the primary consumer of this feature, so I used her account for Home Sharing. NOTE: AirPlay does not require Home Sharing. All the Internet TV shows I watch also happen to be podcasted. Now this is actually a plus for me. When I watch Revision3 TV shows from my TiVo I have to wait for the download to start and buffer up about 5-10 minutes before I can start the show. The plus side of the TiVo approach is that I can queue up a bunch of shows, have them downloaded, and watch and delete them as a group. Also the TiVo can fast-forward and rewind better with the program local. However, Apple TV bests the TiVo on video quality and instant gratification. As expected from my history, there are not too many reasons for me, and I suspect many others, to get an Apple TV. If I were a single guy I’d dump Comcast and TiVo and pay for TV shows á la cart, but when you have three or more content viewers at home, a fixed price all-you-can-eat cable subscription may be more cost effective. I watch about three different shows, and two of them are free from pbs.org. I’d save a lot of coin with pay-per-view TV. This is the future Apple TV was designed for. Someday. Shortly after AirPlay became available the hacks started to appear. My three favorite OS/X hacks are AirFlick, AirPlayer, and Bruce. All three are available from http://ericasadun.com/ftp/AirPlay/. AirFlick is a transmitter. You simply select your Apple TV from the drop down dialog, then drag and drop any video or image and voilá! It’s playing. This is a nice hack. Especially, if you are like me, and do not have your video library in iTunes. Caveat. Apple TV will only play mp4 files unless you hack it. To support this limitation AirFlick will transcode on the fly. However, transcoding any video to 720p mp4 realtime takes a lot of CPU–more than my 2.13GHz Air can provide. I got close with 480p avi files, but 720p and 1080p mkv and mpg files choked. AirFlick issues a warning on any transcode that even if the performance is there, it may have artifacts. AirFlick advises that you pretranscode beforehand. Now, if you are going to go through that process, just to play your video on Apple TV, you might as well place your newly converted mp4 video in your iTunes library. So, AirFlick for sending videos may have limited utility, at least on wimpier machines. This could all change with Sandybridge-based processors iff (math speak: if and only if) some OSS code becomes available. All is not lost however. AirFlick does have some other utility. AirFlick can send images, text messages, and text-to-speech messages. E.g. you can type in the dialog box, “Turn off the lights and go to bed!”, and then press the ‘A’ icon, and then the lips icon to send to the Apple TV your message and have it read out loud. Cool! AirPlayer is a receiver. If you want to see AirPlay in action without an Apple TV, then you’re in luck. iOS devices cannot distinguish the difference between Apple TV and AirPlayer. 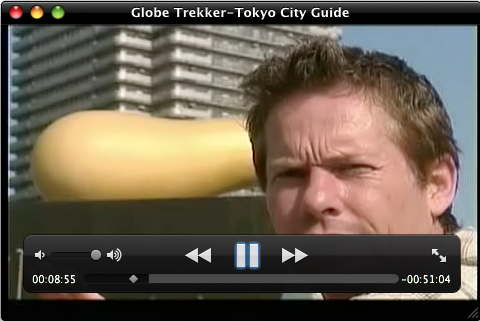 Just fire up AirPlayer and select from the Playback menu where you want the content to go (I used QuickTime (pictured)), and then start sending from your iOS device. Like AirFlick, there is limited utility. All video on my iOS devices (and probably yours) is in sync with iTunes, so why not just play it from iTunes? As other iOS and OS/X apps take advantage of AirPlay some other utility may present itself. E.g. 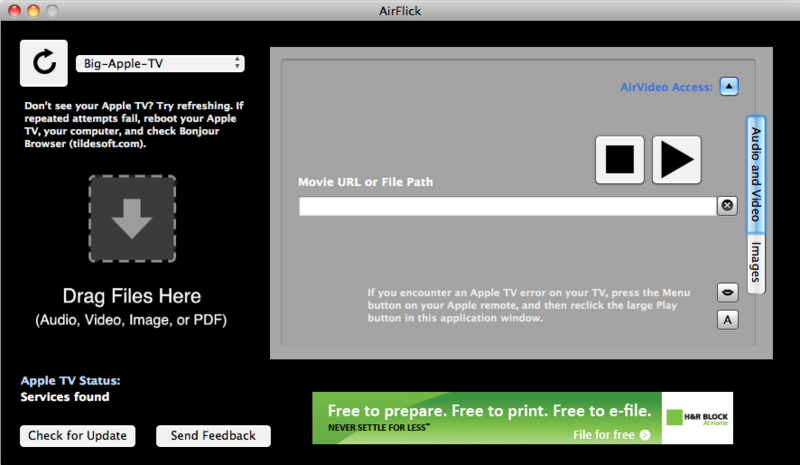 with little effort AirFlick could be modified to send to two or more Apple TVs. Coordinating control could be interesting. For now I have little use of AirFlick or AirPlayer (or for AirPlay in general), but I am glad to see that it has been reverse engineered and that apps are appearing that support AirPlay. Like AirFlick, Bruce is a transmitter, and is the most interesting of the three. Bruce can stream an RSS feed, the weather, web pages, and your OS/X screen. The latter could make it very easy to use Apple TV for any type of static presentation. e.g. PowerPoint slides or PDFs. IMHO, Bruce is just the start of more interesting things to come. Using just about any remote without a QWERTY keyboard to enter text into search dialogs on your TV is really a pain. Fortunately, for Apple TV you can use any iOS device with Apple’s free Remote app to control the content. And, it’s not just a remote with a QWERTY keyboard, but it’s an intelligent remote well integrated with how the Apple TV works and how it connects with your iTunes library. It does make for a better experience. The $99 Apple TV filled my last content gap. Connecting computers to the TV is in my past now (as is building media PCs). Watching TV should be easy, and thanks to HDMI, TiVo, Blu-ray, and now Apple TV, setting up an über centralized content viewing portal in your home is easy too. However, it could be easier. I just want a smart TV with a power cord and have access to all media from the cloud including my media. We will get there, it’s already starting to happen. BTW, I am still not a fan of watching TV. I mostly watch movies–mostly in-home. TiVo and Internet TV have been great for watching content on my time and also allowing me to take it on the road. I mostly get caught up on my shows on airplanes. But, my favorite content of all is still books. I have access to more content than I have ever had in my entire life, but I have no time to enjoy it. Sadly, I control very little of my time. 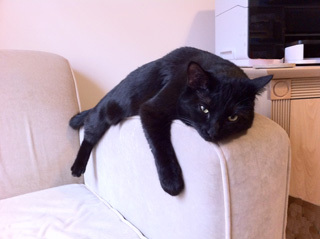 “Couch Potato” is really my cat Koneko “Ko Ko”, and yes, that is how she watches TV.